And Miss Ownbey's results help to explain why the other D.T. scores are lower than the B.T. It has seemed probable that the difficulty of scoring in the center of the pack held the total score for the run at its relatively low level. On this basis, those who score at a level of around 10 in 25 at B.T. would do little over 7 per 25 at D.T. Pearce is a good example of this. Now, Miss Ownbey gets better results in the interior and she scores the highest in D.T. work of all the subjects, once reaching 20 in 25 in one run and averaging 8.4 in 25 over a range of 3,275 trials. It would appear that D.T. scoring is as high as the B.T. for those portions of the pack which are favored by the subject—the central 5 by Miss Ownbey, and the first and last 5's by others. What governs these curves—if not the expectation of the subject? Allowing the corrections made, we have here another good case of joint daily fluctuations in B.T. and P.T.—somewhat better, in fact, than Pearce's. Note the relative agreement of the average per 25 of the totals for B.T. and P.T., again differing by the small figure of 1.1. Now, of course, was the superb opportunity to test the effect of caffeine's integrative influence upon this P.T. scoring. Would it work just as it does upon any complex mental ability or skill; i.e., would E.S.P. rise with the re-achievement of self-control and capacity for attention? Our other data had suggested that it would—and it did! It rose from the level of 6.2 per 25, passed the older amytal level of 7.8 in 25, which had been reached one hour after taking the amytal, and attained the fairly respectable score average of 9.5 in 25. This was now 5 hours after the 5 gr. dose of sodium amytal and one hour after a 5 gr. dose of caffeine. The 300 trials yielded the following scores, varying rather widely: 10, 8, 4, 6, 13, 11, 8, 13, 8, 11, 9, 13. Total 114, an average per 25 of 9.5. During this experiment Zirkle was still sleepy but the effect of the caffeine was clearly noticeable in his general behavior. He had become somewhat more alert and poised, but was by no means fully "normal" yet. 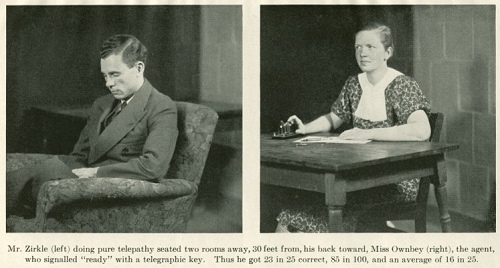 He seemed much like his score average of 9.5 indicated—approximately "half-way normal". Two to three hours later, however, he reported that he was fully recovered. With Cooper distance too seemed to offer difficulty. He said he felt "out of touch" with the agent. 300 trials made by him with Miss Ownbey as agent yielded only an average per 25 of 5.8—without mathematical significance. But Miss Bailey (who, incidentally works in a semi-trance condition that is self-induced) was quite successful in overcoming the "distance delusion" and in the short distances tried, 8 to 12 feet, and 30 feet, she held her scoring average up to par, obtaining in 475 trials an average per 25 of 9.1 at the shorter and 12.0 at the longer, with 150 trials. Both scores are above her general average.